You can access your Google My Maps on your iPhone! Simply visit, from your iPhone, http://my-maps.appspot.com/maps. The Google Maps app is unable to tap into "My Maps". 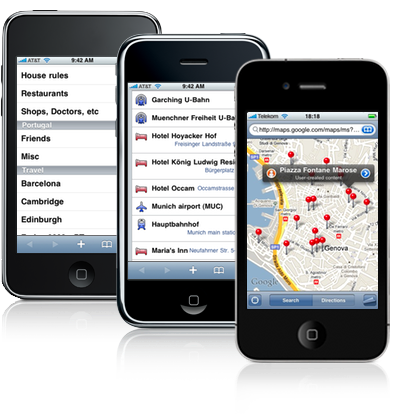 This service gives you access to your maps, on your iPhone. Those pages are meant for browsing by an iPhone, and won't be fully functional on a desktop computer. But you can test-drive it using a WebKit browser like Safari or Google Chrome. For easy access: in Mobile Safari, add a bookmark or to home screen! Known limitations: lines and shapes cannot be oppened in the iPhone native Maps app. Description support is limited. Problems? Questions? Suggestions? Send a message to the support page. Web page design based on karate korners. iPhone page layout uses WebApp.Net. Site written in Python, powered by Google App Engine.